This is a whole different style of card creation and since I don't intend to do it ever again, I didn't want to create a new category for it! The original sketch for this is a design for a 12 x 12 quilting block applique. I shrunk it down to fit an A2 card and traced/cut the pieces from patterned cardstock (10 different ones). Each piece is glued individually onto the black dotted background. I glued some green twine on for stems. 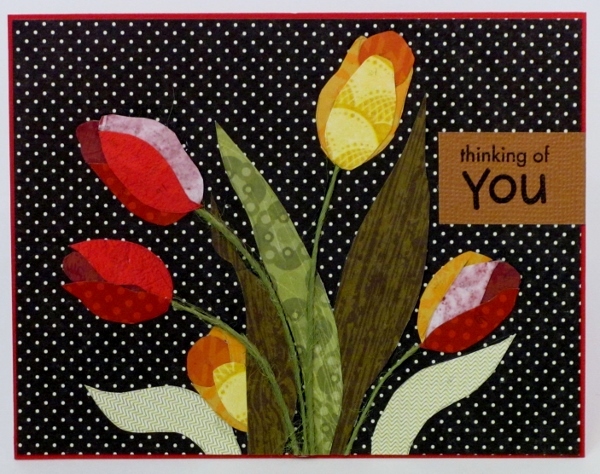 I trimmed it a bit to leave a fine red border of the card base showing and added a stamped sentiment block to the right to fill some open space. I also inked all the edges of the pieces used for this card. My original touched on this one was the shape of the scrapbook paper (because of the corners I cut off for yesterday's card) and using bits of ribbon as 'photo corners' on the front panel. I can't believe I PAID for these cheeseball supplies! It cost me $3.50 apiece to make these two cards. The second project the cruiseline had available was making cards. Basically, we got a packet with 2 folded card bases, 2 buttons, 4 rhinestones, 2 scrapbook paper bits, 4 paper flowers, 2 rubons for the card back, a length of ribbon, and the use of two rubberstamps. 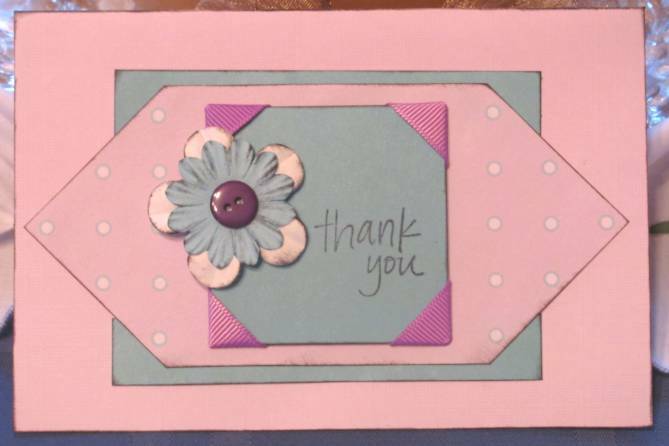 For my first card I cut corners off one of the scrapbook papers, inked the edges of everything with the black inkpad and layered it all with glue dots. For the front panel I stamped the greeting on it and then cut my popsicle stick (for applying rubons) into bits and used glue dots to make dimensional spacers for lifing the panel away from the backing. I used three pieces of the ribbon to make 'leaves' for my flower. Last little onesie. 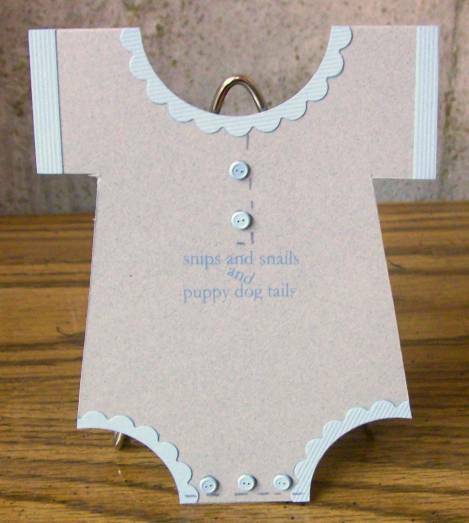 This little boy card has a design made with rub-ons. I drew a little placket around the buttons with a marker. For a change I used a printed cardstock for this onesie so it looks a little more like fabric. The front design is a vellum sticker. To turn the little girl onesies into little boy onesies, just leave off the bow and add in a couple of buttons at the neck. The design on this one is a simple sticker. 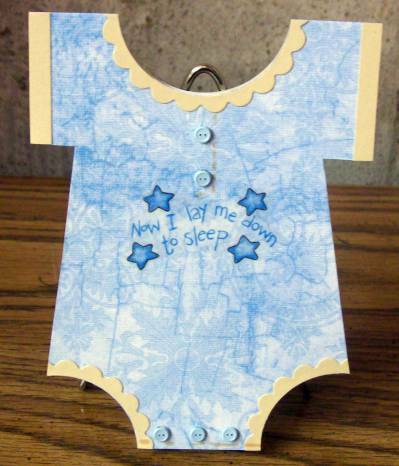 Second of the onesies cards for the buttons and bows challenge. Everything is pretty much the same as yesterday's card except different colors and I used a vellum sticker for the decoration. 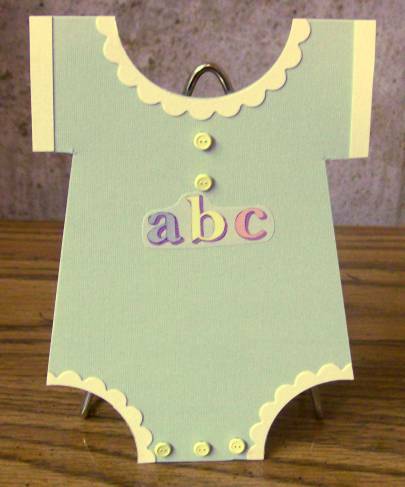 These are going to make such cute shower cards. Another challenge - different group! The theme of this challenge was 'buttons and bows'. 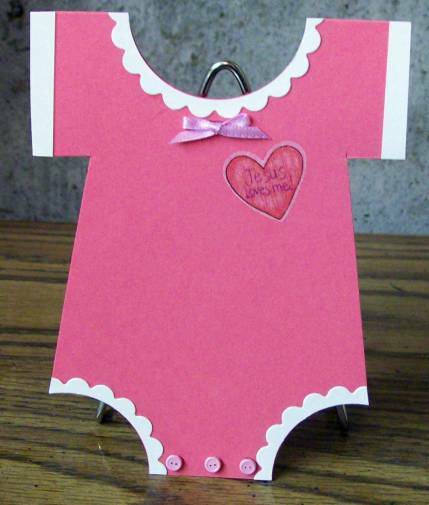 I saw a picture of these onesies cards the other day and knew that was what I would do to fulfill the challenge. The neck and legs are cut with a large circle punch. 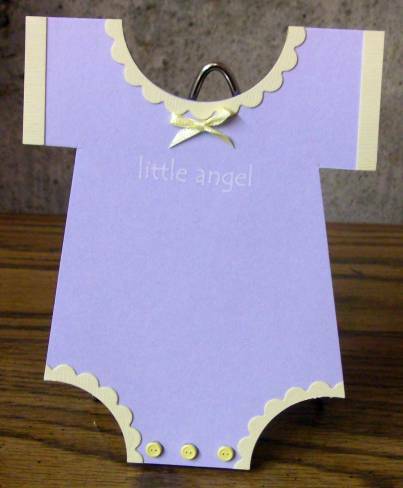 The ruffles are the same punch out of contrasting cardstock and then cut around with a scallop circle nestability die. The buttons are tiny brads but I cut off the legs and used glue-dots to attach them (and the little bow at the neckline). 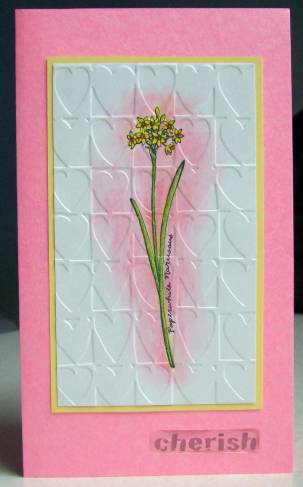 I used white rub-ons to put the text on the front of the card. I embossed these butterflies onto a metallic finished blue paper with the Cuttlebug and a brass stencil, then trimmed around. 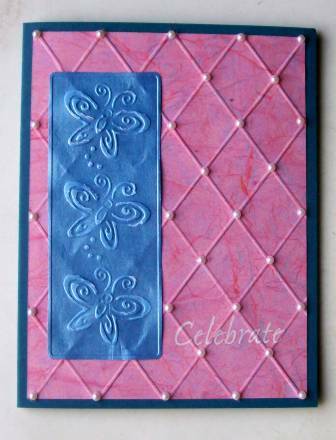 The backing paper was emossed into ridges with the Scor-It to create a diamond pattern. I applied half-pearls at each intersection for a little elegant touch. The greeting is a white rub-on. This was done on a light textured cardstock, hand colored with colored pencils and waterbrushed to blend. I mounted to cardstock covered with a spotted paper, added two stickers and used two ribbons to tie a bow up top. 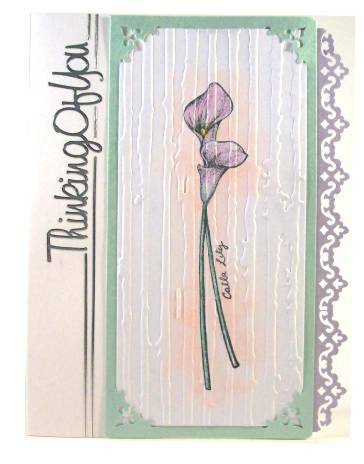 I may be close to winding down this series of stamped and colored card styles. But here is what today brings. 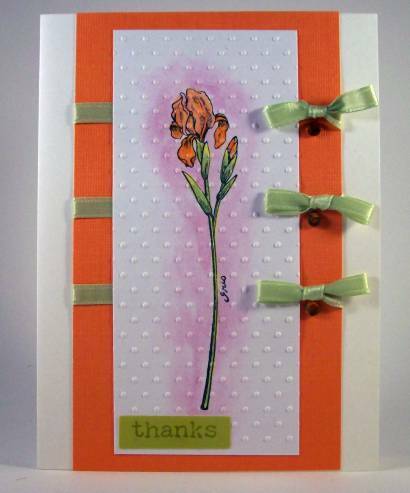 The orange cardstock perfectly matched the flower coloring. Before attaching them together, though, I tied three bows around the orange with some green satin ribbon. Each bow then got a 'drop' of orange rhinestone as an accent. The focal unit was then attached to a white card base and I added a text sticker in a coordinating green tone. This lily went through the Swiss Dots Cuttlebug folder after coloring. 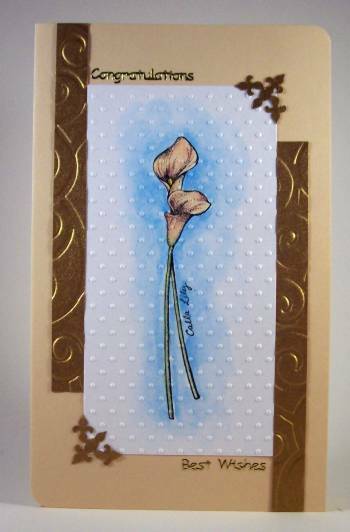 The tan cardstock was chosen for the match to the flowers. I started shuffling scraps from the paper cutter and hit on the fold embossed stripes to apply to each side. They were shorter than the cardstock background which led to their offset placement. Then the other two corners were just left hanging out there so I used a corner punch to make some matching corner trims. 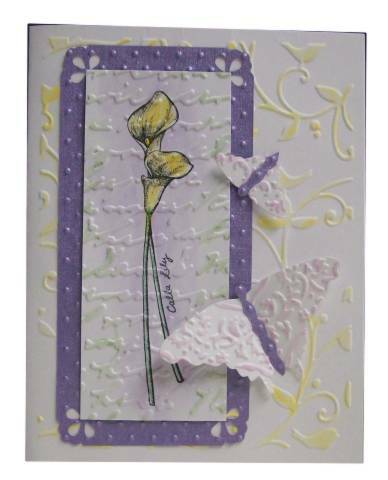 I added a gold peel-off greeting at the top and at the bottom for balance and then used the corner rounder on two opposing corners of the card base. I started this with just the white folded cardstock and embossed the front. The sticker came next and it was a little too much color in all that sea of white so I chose the colors from the sticker and did light watercolor washes over the raised areas of the image. The last step was to add silver peel-off borders along the sides. I should have taken into consideration the difficulty of photographing whites and pastels before embarking on this long journey of card-making with rubber stamps! 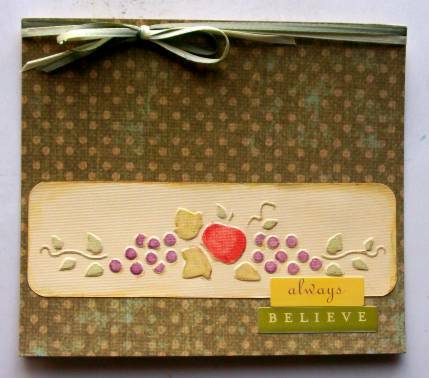 After stamping and watercoloring the image I ran it throught the Distressed Stripes folder for texture. Punching the corners of the green panel allowed me to tuch the corners of the white panel into it. Then I trimmed the right edge with a border made with a Fiskars border punch. Attached to a folded white card base it left a white block on the left which I filled with a silver peel-off greeting. The text looked odd just hanging out there so I added some stripes of silver to anchor it. 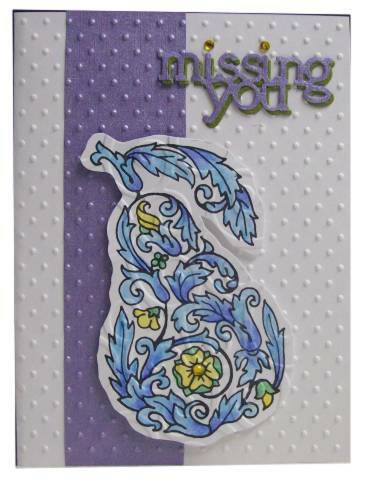 I embossed this colored stamping with the Hearts Cuttlebug folder. A simple frame of yellow to bring out the color of the flower and a pink folded card base to bring out the pink on the painting. The text is a thick acrylic sticker. 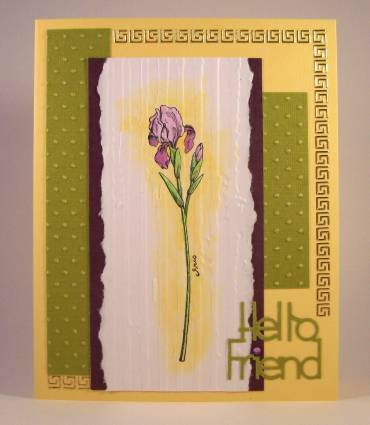 I liked the texturing of the stamped and colored iris from a couple of days ago so I did it again. Different paint job and differeint embossing folder, though. I used Weathered Wood for this one. In keeping with the distressed look of the stripes, I tore the side edges and then backed with purple card to bring out the flower's color. 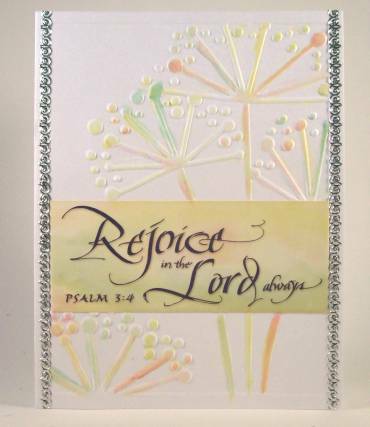 Two scraps of green card were embossed with the Swiss Dots folder and I used a Cuttlebug die to cut out the greeting. The greeting fot a rhinestone to dot the 'i' and I bordered the open areas with some gold peel-off sticker. Yep, more watercolor pencils on rubber stamped images. This one I put through the Cuttlebug script folder and then went nuts creating lots of white layers with different folders. On each I used just a hint of color on the raised portions to create depth and coordinate with the image. I cut a couple of butterflies with Spellbinders dies and embossed those, too. Then they are mounted with pop-dots to raise the wings up. I punched the corners of the one colored layer (purple). No text is added so it stays simple and clean. No color on this one. 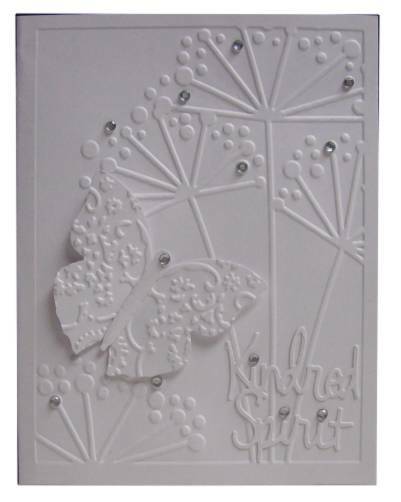 Just many layers of white embossed with various Cuttlebug folders and a couple of die cuts. The butterfly is mounted 3D and I went to town with the clear rhinestones for embellishment. You really can't see very well that I embossed the pear with the Swirls folder. It is raised on pop-dots over the Swiss Dots background. 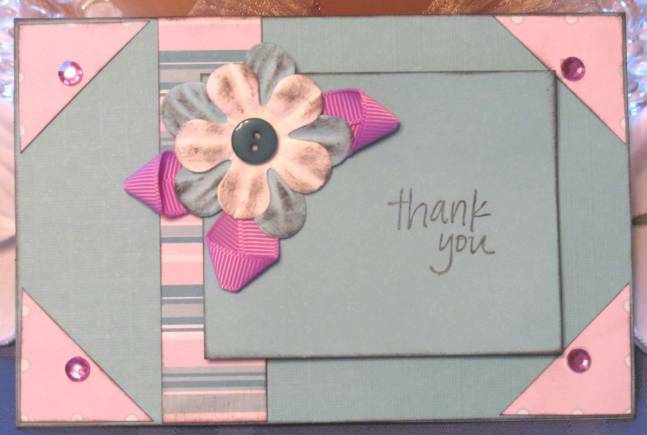 The text is two layers of cutting from a Cuttlebug die. 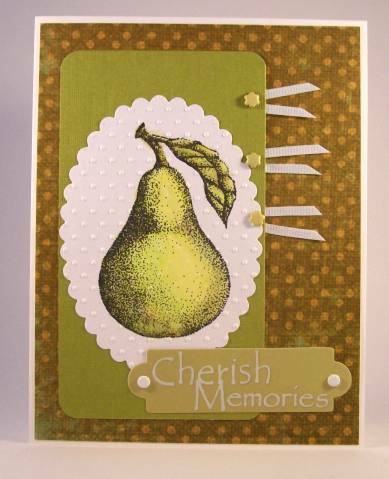 I used three rhinestones - obviously to dot the 'i's' and one in the center of the bloom on the pear. To me there are two things that always make me thing 'crisp': the color white and Swiss Dots. So, white dots surrounding a green pear must be really crisp! I placed some snippets of grosgrain ribbon at the right edge of the focal piece and then added lime green floral brads as accent. After adhering all together I added a green tag with white rubons and placed white round brads as accents.